This is a member of the order Auriculariales, characterised by the production of a metabasidium that is divided by transverse septa into 4 cells. The sac fungus has a well-developed, large fruiting body that is gelatinous and quite leathery. 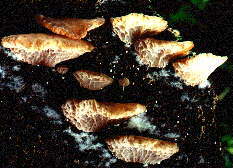 Basidiocarps are edible and kits containing the necessary ingredients for growing the fungus are available commercially. It can be bought dried in many stores in Asia, and is served in some Chinese restaurants under the name Yung Ngo or Muk Ngo. When dried and hard, they are quite unappetising, but when soaked in water they billow up like clouds to show their delicate curves and convolutions to great effect. Some of these fungi are parasitic on plants but the majority are saprophobic. There are 19 species of Auriculariales. Some people also recognise a second family within the Auriculariaceae, called the Phleogenaceae. The most common species is the Auricularia auricula, known as the Wood Ear or Tree Ear. This could easily be mistaken for a cup fungus, but it has a more rubbery texture and bears its spores on basidia. It often grows with its fertile surface facing downwards. When dry, the fruiting body is hard, 2-15cm broad, cup-shaped to ear-shaped or occasionally with several earlike lobes coming from a central attachment point. The outer surface is sterile, veined or ribbed, and pale brown to brown to liver-brown, drying blackish. The inner fertile surface is smooth or slightly wrinkled, gelatinous when wet, tan to yellow-brown, greyish-brown, brown, or tinged purple, and blackish when drying. Its stalk is absent or rudimentary. Spores are white, borne on the inner surface (usually the lower one), 12-18 x 4-8 microns, and smooth and sausage-shaped. It is solitary or in groups or clusters on logs, dead branches, stumps etc. It is very widely distributed on both hardwoods and conifers, often common in cool weather.